Rubber Room Ramblings: MORE AUTUMN DAYS! I am still playing with Michelle's stamp set, and still having a ball! This card was pretty simple to make other than the trimming ("cutting" as my customers are fond of saying). 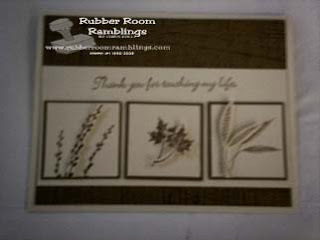 I used my Sanded Background stamp from Stampin' Up! and inked it up with some Soft Suede Classic Ink, then stamped it onto some Soft Suede cardstock. I stamped my images from the Autumn Days stamp set in Soft Suede Classic Ink onto Naturals Ivory Cardstock and cut the cardstock into squares. Then I stamped the images again, trimmed them and then attached them to my square piece (with the image already stamped on it) useing some dimensionals. Then I just added a sentiment from A Rose Is A Rose stamp set. I am going to make more of these so I can change the sentiment to be for a sympathy card or a masculine birthday. I am amazed at how versatile this Autumn Days stamp set is! !